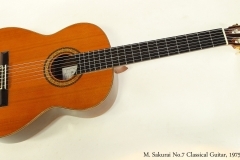 Sakurai Classical student guitars are relatively unusual, as Masaki Sakurai worked mostly under the name of his celbrated uncle, Masaru Kohno. The set of guitars with labels reading ‘M. Sakurai Supervised by M. Kohno’ are from the period where Sakurai was still learning the craft. At Kohno’s death in 1998, Sakurai took over the workshop and now produces the Kohno guitars plus models under his own name. Now, they are professional grade. This M. Sakurai Number 7 guitar labelled as supervised by M. Kohno, and dating to 1975. It features a solid cedar top, laminate Indian Rosewood for the back, sides, headplate and bridge, Mahogany for the neck (and blocks) with Ebony for the fingerboard. The binding is also rosewood. The construction looks like it’s done in the traditional Spanish style, with a ‘slipper heel’ but it is possible that the neck actually attaches with a dovetail joint. 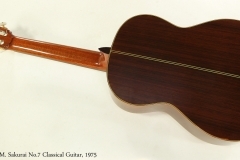 This example is a concert style guitar, with a 660mm (25 inch) scale length and 53mm (2.1 inch) nut width. It’s designed to be played to fill a larger room, with the long scale and extra tension providing the power to drive the top. This guitar is in very nice condition, and plays well. These instruments are well constructed – it’s plain that Sakurai was devoted to learning the craft and paid a lot of attention to his work. The supervision of Masaru Kohno makes these instruments notable, and points to their underlying quality.